Paul Wallace was born on October 10, 1922, in San Francisco, California. He enlisted in the U.S. Army Air Forces on October 29, 1942, and was trained as an aircraft engine mechanic, serving at Demming Army Air Field, New Mexico, and then at Douglass Army Air Field, Arizona. 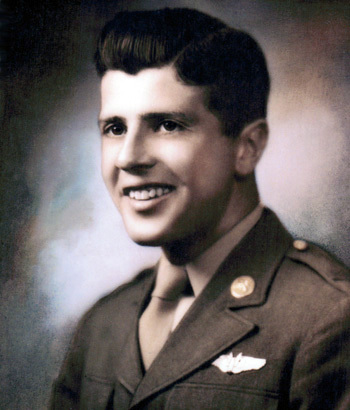 CPL Wallace was accepted for aerial gunnery school in July 1944, and after completing the program in Lincoln, Nebraska, he was assigned as a B-17 Flying Fortress waist gunner at Biggs Field, Texas, and then at Sioux City Army Air Field, Iowa, before the war in Europe ended. He then volunteered as a B-29 Superfortress flight engineer, but World War II ended before he could be shipped to the Pacific. His final assignment was at Buckley Field, Colorado, where he served as the commanding officer's flight engineer and ground crew chief until his honorable discharge from the Army Air Forces on February 9, 1946. After leaving the military, Paul worked in sales for 20 years before serving with the Treasure Island Fire Department in San Francisco from June 1966 until his retirement as Battalion Chief on June 30, 1986. On May 17, 1988, his name was recorded in the Congressional Record of the 100th Congress for his part as officer in charge in successfully fighting the fire aboard the oil tanker SS Puerto Rican 50 miles out at sea from the San Francisco Bay area from October 31 to November 1, 1984.